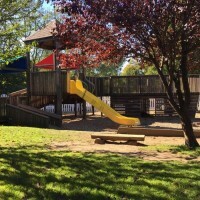 The Children’s Community Development Center in Westport Connecticut emphasizes active engagement in learning: creativity, exploration, investigation, experimentation and discovery. All of our indoor classrooms open directly to the outdoors. The proximity to our outdoor space made the extension of intentional teaching from the indoors to the outdoors not only natural, but sensible. In 1992, our families and staff came together to greatly improve the outdoor environment for our children. A parent-architect designed a play structure to encourage a continuous play experience-providing challenging, achievable opportunities for play, exploration and learning. For one very busy and long weekend, families and staff came together and built a legacy that has anchored our outdoor classroom since. 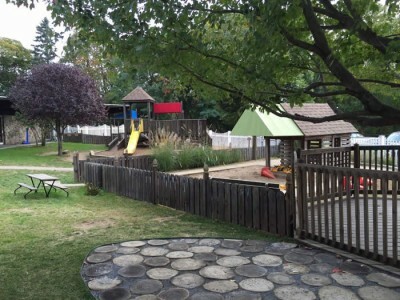 A few years later, we added a playhouse, designed and built by parent volunteers, planted trees and installed a sprinkler system to improve the condition of the landscaping and to create more water play opportunities. We built a large shed to store our tricycles and riding toys and replaced chain link fencing with more attractive white PVC. The asphalt path that runs through the middle of the playground was replaced with brick pavers. Benches and more outdoor storage were added in the years that followed. For the next several years, our focus was on improvements to our indoor classrooms. In 2011, we took a fresh look at our outdoor space and concluded that it was time to expand opportunities for the children. Landscaping was improved and thanks to a gift from the Class of 2011, a deck was added around our largest tree. A family gift in memory of the Director’s father funded a hand-pump and log sluiceway, a log bench and tree stumps. Belgian blocks were installed for edging and an awning was constructed over our playhouse and above the outdoor stage to define a Music and Movement Area. In 2012, thanks to Deloitte “Impact Day” volunteers, we replaced the decking and handrails on our wooden play structure with composite wood and added fencing to enclose areas. A custom outdoor water table was added to that area as a gift from the Class of 2012. A grandparent in our program designed a perennial garden behind the playhouse and parent volunteers planted flowers and ornamental grasses. 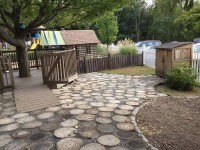 A stone path was installed around the sandbox and playhouse garden. The Class of 2013 donated a large shed filled with outdoor blocks to create a Building Area and we constructed a raised bed vegetable garden. 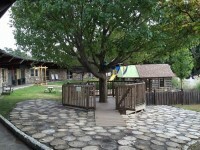 The Class of 2014 added a welcoming arbor and tree cookie flooring around the Gathering Area/Tree House and Building Area. It is our goal that the environment encourages active, creative play and invites children to run, lift, climb, dig, push, drag, balance, swing, ride and delight in their time together. We have truly created an outdoor classroom “Where Joys Never Cease”.